Following the launch of the extremely well received 1971 edition last year, the award-winning distillery has now released the 1972 Warehouse 6 Collection to the market, the second release in a series of six. A single malt captured in its prime by the distillery men before too much was lost to the angels, the 1972 Warehouse 6 Collection is bottled at 42.1%abv and has a limited run of only 380 bottles. The 1972 Warehouse 6 Collection has a distinct and complex character - with aromas of summer meadow wildflowers and flavours of sweet almond, coffee and winter spices - which have been developed over four decades of maturation, under the watchful waiting of the casks’ dedicated custodians. This exquisite single malt is part of Tomatin's Warehouse 6 Collection – a celebration of casks matured in its traditional dunnage warehouse. It has been aged in three sherry hogshead casks (23404, 23405 and 23406), laid low on antique wooden rails, above cool earthen floor, in the very heart of the Tomatin Distillery grounds. 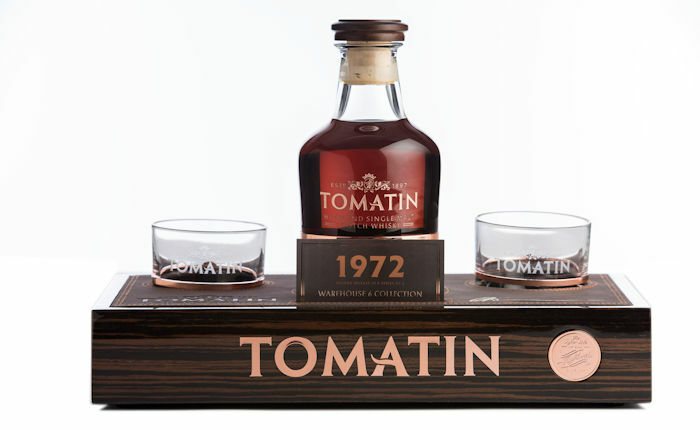 The 1972 Warehouse 6 Collectionis presented in a stunning wooden presentation box. The box is opened by pressing lightly on two rose gold metal buttons found on the side of the box, which allows the top to be lifted off revealing the bottle and glasses. Inside, a wooden podium base holds the hand-blown Glencairn Crystal decanter and glasses decorated with solid copper bands. The bottle boasts a solid copper stopper and a numbered certificate detailing the story of the whisky. 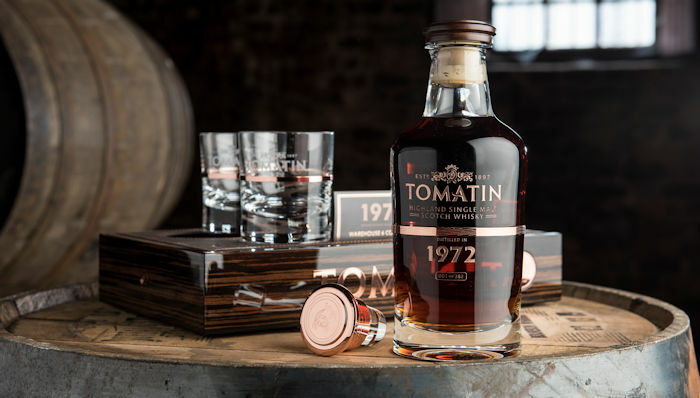 Stephen Bremner, Sales Director, said, "It is very exciting to finally launch the 1972 Warehouse 6 Collectionmalt, which has been sitting patiently in some of our most treasured casks, maturing and growing in flavour; just as the Tomatin brand itself has grown throughout the years. We wanted to create a range of whiskies that truly capture the heart of the distillery. This we achieved initially with the 1971, and now with the 1972." The 1972 will retail at £2,000 and will be available from luxury whisky retailers by mid-August. Tomatin recently won Distiller Of The Year 2016 and Brand Innovator Of The Year 2017 at the Icons of Whisky Awards. Tomatin currently ranks in the Top 10 Single Malt brands in the USA and is one of the fastest growing in the UK.